Kenneth Griffin started today 2nd in chips out of the 21 players remaining. 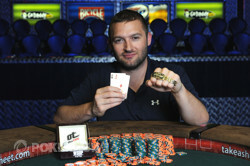 He fought hard, played aggressively, and battled his way to his first WSOP bracelet. Griffin had to battle a field of players including the likes of Antonio Esfandiari, David Baker, Andrew Teng, and our chipleader to start the day Jonathan Driscoll. In the first hour of play today a whopping seven players were eliminated narrowing the field down to 14. Griffin helped with those eliminations a bit by knocking out Nicolo Calia in 16th place. Esfandiari had trouble gaining momentum at beginning of the day with his stack dipping to as low as 200,000 at one point. 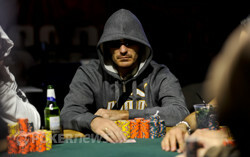 David Baker came into the day short stacked and although he fought hard, he was eventually eliminated in 13th place. When we reached the final table, Esfandiari had rebounded to take the chip lead while Griffin wasn't far behind him. 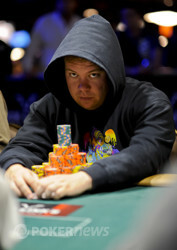 The first player eliminated from the final table was Jeremiah Siegmund and he was followed out the door by Aaron Massey. Esfandiari started the final table with the chip lead along with being the far-and-away most experienced player at the table. Unfortunately, he lost a few huge pots early during final table play which included running into aces when he held ace-eight on an ace high board, and running king-ten into another players ace-king and he was knocked out in seventh place. 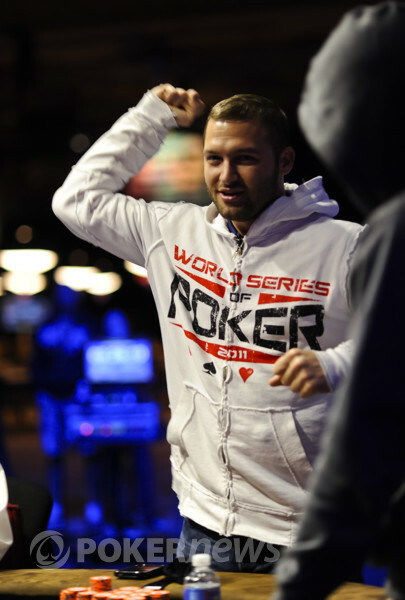 Jonathan Lane, who was the chip leader at the start of day 2, was next to go in sixth place and he was followed by Andrew Teng in fifth place who racked up his 4th cash in the 2011 WSOP and his 12th overall WSOP cash. Eric Baudry stayed quiet for most of the day, not getting involved in many big hands and eventually was eliminated in fourth place. Our third place finisher was Philip Hammerling who had never cashed in a WSOP event before today. He flopped trip sevens from his blind in an unraised pot and was outdrawn by Griffin's flush draw to be eliminated. When we reached heads up play it was obvious to all present that Griffin's aggression and gutsy plays were getting under the skin of Jean Luc Marais who couldn't seem to gain any ground. On the final hand of the night, Griffin already had a large chip advantage to his opponent and found himself in a dream situation. Marais declared he was all in preflop and Griffin looked down at his cards... pocket aces. He excitedly called and found that he would only have to beat Marais' king-six offsuit to take the bracelet. The board ran out blanks and Griffin's rail went crazy with excitement, hoisting the champion onto their shoulders and singing his praise. Griffin is no stranger to battle as he served in the Marines for more than 10 years including tours in Iraq and Afganistan. He now works as a consultant for the Marines and just got back from an eight-month trip to Afganistan a week ago. His brother and many of his friends were present to witness his victory and it was clear from the looks on all their faces that this would be a moment none of them will ever forget. Congratulations to Ken Griffin, winner of Event #45: $1,000 No-Limit Hold’em, he takes home $455,356 and his first ever WSOP gold bracelet for his achievement! Since heads-up play began, Kenneth Griffin seized control of the match against Jean Luc Marais, relentlessly reraising the Frenchman and bullying him in nearly every pot. Whether Marais was simply card dead or unable to accurately read his opponent we will never know, but Griffin had the upper hand from the start. After losing a few big pots by folding to Griffin's pressure, Marais became visibly frustrated and began angrily sliding his cards away. Eventually, Marais decided to shove all-in before the flop, trying to give the American a taste of his own medicine. Griffin was having none of it, however, and stood triumphantly while yelling "Call!" He revealed his and thrust his arms skyward, knowing he was on the cusp of the greatest achievement a poker player can accomplish. Marais seemed frozen when he saw Griffin's monster, and he reluctantly showed down his bluff. Griffin's vocal supporters on the rail exploded in celebration, knowing their man was five cards away from capturing his first WSOP bracelet. The dealer spread a flop of across the felt and Griffin exhaled slightly, knowing he had survived the danger of the flop. When the arrived on the turn, both players seemed to hesitate for a moment, unable to process that the tournament had come to an end. Marais was drawing dead and Griffin finally began screaming in joy as he rushed to embrace his brother and best friends. The dealer dropped the on the river to make everything official, and Kenneth Griffin became the WSOP's newest champion. Jean Luc Marais fell one player short of claiming an unprecedented 4th bracelet for his native France, but he earned $282,676 for his deep run, as well as the respect of Griffin and anybody else who watched him play the game. It seems that Kenneth Griffin's aggressive play is working so far during this heads-up match. Jean Luc Marais raised to 205,000 on the button and Ken Griffin re-raised to 705,000 from the big blind. Marais called and they saw the flop come . Griffin bet out 1,000,000 and Marais folded his hand. On the very next hand the two players saw a flop of and Marais bet out 175,000 only to have Griffin raise to 500,000. Marais angrily slid his cards away and began rubbing his head, Griffin's aggression obviously getting to him. With many in the poker world dubbing this year's WSOP a British Invasion, due to the extraordianry performance of English players thus far, the French have quietly asserted themselves as a nation to be reckoned with. A total of three Frenchman have captured WSOP gold and glory in 2011, including Fabrice Soulier in Event #37, the $10,000 HORSE Championship. Bertrand "ElKy" Grospellier shipped Event #21, the Seven-Card Stud World Championship and Elie Payan won Event # 22: $1500 Pot-Limit Omaha. Having reached heads-up play here today, Jean Luc Marais has a chance to give France its 4th bracelet of the WSOP, repelling the supposed British Invasion and replacing it with a new French Revolution. Ken Griffin limped on the button, Jean Luc Marais called from the small blind and Philip Hammerling checked his option. The flop came and both Marais and Hammerling checked and Griffin bet 100,000. Marais called and Hammerling raised to 290,000. Griffin called and Marais folded. The turn was the and Hammerling bet out 535,000. Griffin called again and they saw the come on the river. Hammerling announced he was all in and Griffin immediately called. Hammerling had flopped trip sevens but had been outdrawn by Griffin's flush. Hammerling was eliminated in 3rd place. Kenneth Griffin raised to 230,000 from the small blind and Jean Luc Marais defended his big blind with a substantial raise. The Frenchman made it 660,000 to go and Griffin immediately announced himself all-in. Marais stood and slammed his on the table after making the snap-call. Griffin also rose to his feet while revealing his , telling his rail "I gotta get lucky here boys." The flop fell and despite the baby cards on board, Griffin's eights had not matched up. His supporters began hollering for a seven to hit on the turn, which would give their man additional outs to a straight, but the arrived in its place. The turn card did give Griffin a gutshot straight draw and he would now need an eight or a seven to fall on the river to take the pot. Both players flinched when the nine hit the board, as it looked suspiciously like the prized eight Griffin needed, but it turned out to be a blank and both players retook their seats. Griffin gave up the chip lead to Marais and the two essentially traded chip stacks after the hand. Kenneth Griffin celebrates knocking out Andrew Teng. Jonathan Lane is out in 6th. Jonathan Lane is all in. Antonio Esfandiari is eliminated in 7th place. Antonio Esfandiar is all in.